These custom designed wedding gowns were designed for these brides using their feed back to create the dress of their dreams. The wedding gowns shown have a lot of design details in the gown and include some specialty trim, embroidery, or other fancy accenting item. 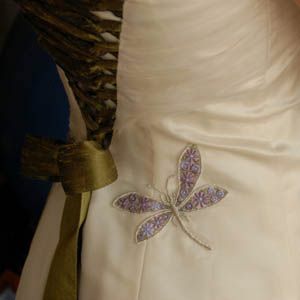 Your gown will be made of 100% silk fabric exclusive of trim or specialty fabrics, which will all be of high quality. Also like the gowns shown here, your wedding gown can include an overlay of sheer silk fabric over a silk satin. A matching veil can be provided upon request. 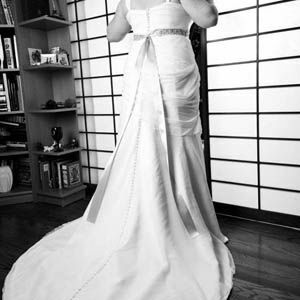 Our designer will work with you to create your own one-of-a-kind dress that flatters your body type. This process will entail several meetings which include; initial consultation, designs drawn exclusively for client, materials to choose from, measuring, Moulage created for client, 3-5 fittings, final fitting with delivery, and dressing on the wedding day if needed. Please note that you must be in the San Francisco Bay Area or its immediate surroundings otherwise you will need to provide additional transportation costs.